Let’s be honest – unless you sell something that is scarce or in high demand, such as power or bottled water in the desert, people may not really care if they’re going to buy from you or someone else. That’s why your approach means everything and understanding your clients will provide the best path to success. People have problems to solve, not products to buy. That’s why a good salesperson will use the proper approach and provide information in the right way to open doors. Let’s look at some common approaches of highly successful sales people to boost your sales. Whether your prospective client has an I-type personality or a “C,” the ability to connect with them is almost as valuable as actually landing the deal. You have to understand, not every sale will convert right away and not every conversion is even promised. Building trust and cultivating relationships, however, will eventually tear down barriers and lead to sales and/or referrals within the near future. 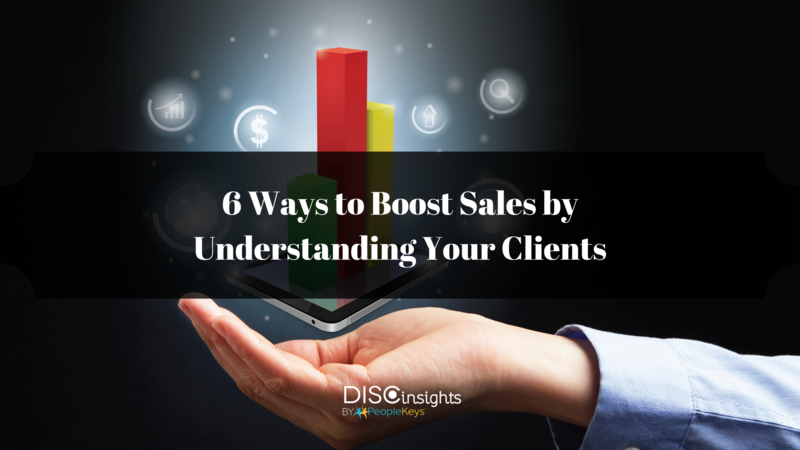 Understanding your client’s motivations, what drives them and why they are even interested in hearing about your product or service can be what makes or breaks a deal. Building trust and rapport will encourage them to take a leap of faith, where they might otherwise pocket your information and run away in the other direction. Being able to relate to your prospects will allow you to connect with them in ways that prove most effective and influential. If you’re not in it to win it, small talk might seem insignificant to you. But, ultimately, small talk provides you with the right leverage and means of introducing your products or services at the drop of a dime. If you don’t know what your prospect wants, how will you appeal to their needs? If you don’t know what this person needs, how will you provide them with a solution? Act like an entrepreneur, whether you own the business outright or are the smallest man on the totem pole. Entrepreneurs solve problems for their customers and provide them with a unique solution in which only they can solve. Getting to know your customers will allow you to get to know their businesses. Understanding their problems will allow you to provide them with answers. Figuring out which information they need to make a final decision is everything. Understanding the scope of their next project is also everything. If you’re catering to a business and are in talks with a project manager directly, understand that this person needs to gain approval for everything they do. They need to include it the budget and have it by a certain day and time. If you can meet those needs, you’re in the winning. If you can’t, then you might have to wait until they take on their next project – if at all. Your customer may be afraid to purchase at this time. Maybe, budgets are low. Maybe, they just don’t want to be taken advantage of. Realize that these people need assurances. They need to know that they will make their investment right back. They need all of the facts. They don’t want you to sugar coat anything. In fact, if you are dealing with a C-type or D-type personality, you can almost always bet that this will be the case. As a final line, remember that every person is different, as well as every salesperson is different. Sometimes their personalities click right away, but most times this is not the case. Don’t rely on the pure chance of mix-and-match, but boost your sales by learning to adapt your sales style according to the DISC personality style of your client. Mastering your sales skills and human understanding with behavioral selling will definitely boost your sales. Learn more about the PRO-SOLD strategic sales method and remember – this is not a typical sales training, but a framework for success.